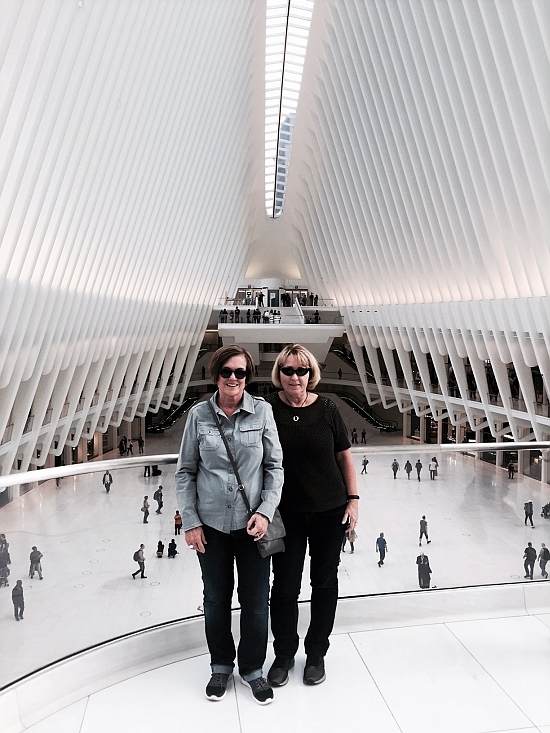 Noma Hanlon and I recently took the subway from New York City’s midtown to Park Place in lower Manhattan and exited the station near Oculus—a landmark piece of architecture designed by Spanish-born, neofuturistic architect, structural engineer and artist, Santiago Calatrava. We actually wouldn’t have known about Oculus if we hadn’t visited the 9/11 Memorial Museum. 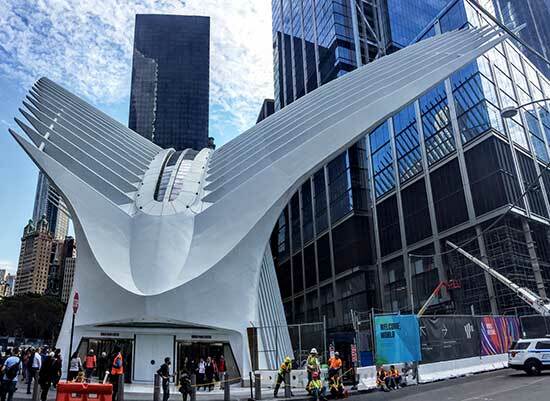 Sited adjacent 9/11 Memorial Plaza, Oculus, is a sculptural masterpiece of structural steel (12,500 tons) and glass that suggests the wings and torso of a white dove. 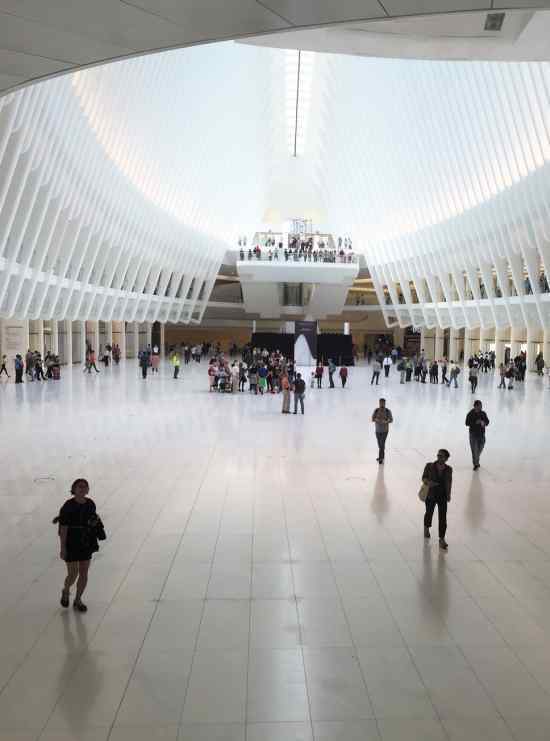 Inside Oculus is a train station, but not just any station. Oculus is One World Trade Center’s transportation hub opened in March 2016 that connects New Jersey’s PATH trains with New York City’s subways. Its concourse will ultimately connect visitors to 11 different subway lines and will be the most integrated network of underground pedestrian connections in New York City. The extraordinary space also houses a high-end shopping mall and restaurants. Oculus sets an inspirational tone for visitors arriving at 9/11 Memorial Plaza and is a tribute to the power of great design. Across the street and beyond the Memorial pools, rises another architectural marvel, One World Trade Center. Like a giant modern lighthouse, the skyscraper rises to 1,776 feet and is the tallest building in the U.S. Visible for over 20 miles away, it recaptures the New York City skyline and establishes a new civic icon for our country. As we walked from Oculus and on to the plaza we peeled off our jackets to adjust to an 82 degree day—totally unexpected for mid-October in the city. 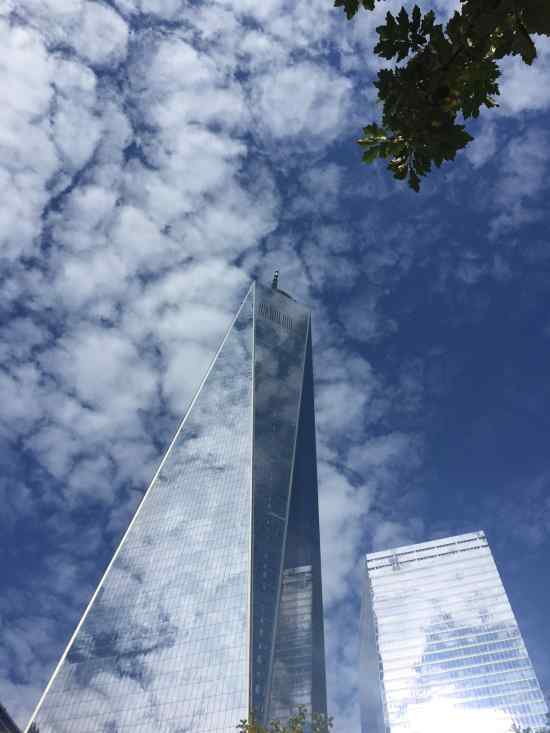 Once on to the plaza I looked up to see a bright blue sky framed by lightly mottled, almost translucent clouds loosely connected like a fragile island chain. The setting was moving and amazingly beautiful! Armed with only my iPhone, I began snapping photos of the skyscraper, the clouds and their pale reflection in the building’s windows. Noma and I were both surprised to see so many commercial planes once again flying so close to the new trade center and memorial grounds. After watching multiple planes fly over I realized it was a good thing. 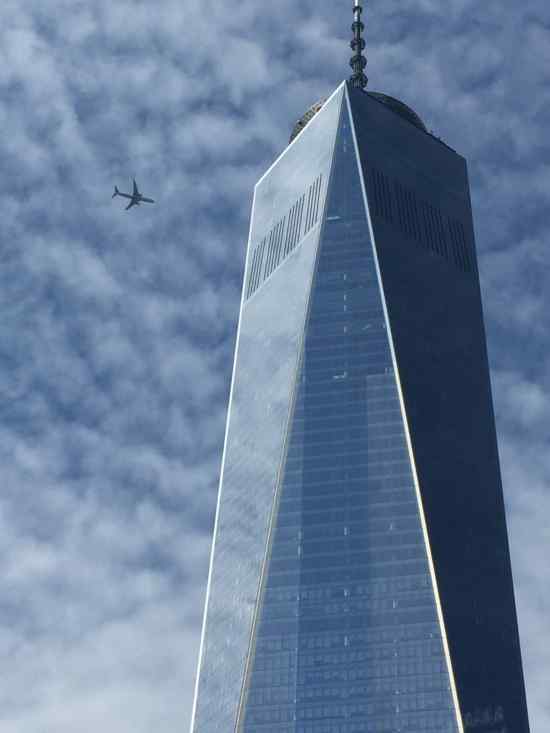 The shock of the 9/11 attacks and sadness that still remains within me was actually soothed by watching the commercial jets fly over. It was healing to know we’ve found our way forward and returned to a more normal routine. We will remember and recover but we will never forget. This understanding allowed me to experience the Memorial Museum and its stories of loss and survival on a more profound level.